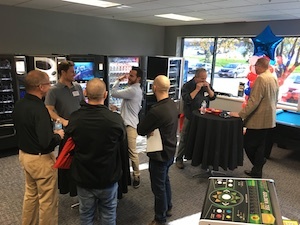 AVS Companies has recently moved into a new facility in the Minneapolis area, in the US state of Minnesota, and celebrated with grand opening events on November 8 and 9. An event for vending operators was held on the first day, with one for amusement operators on the second. Attendees enjoyed a catered lunch and beverages and received a commemorative gift that was engraved on site. “We really want our customers to know that they are welcome in our facility at any time,” said company president Vince Gumma. The facility, which measures at almost 10,000sq.ft, houses a vending and amusement showroom, parts department, repair shops, warehouse and loading dock.